EMF Balancing Technique® Bridges of Grace Combination Sessions - a two-part webinar series. To prepare your personal energy for 2019 I am offering 2 classical EMF Balancing Technique® sessions. With the focus on “tuning up” energetically and “tuning in” multidimensionally to the opportunities ahead in 2019, you will experience the unique resonance of the first four EMF phases in two exciting and joy-filled combination sessions! Our time together will also be filled with the supportive energy patterns of Phoenix Inspirations and Insights. Honor the unique expression of your Phoenix energy, and experience the renewing and regenerating energy of conscious commitment to your very essential reasons for being. This webinar series is presented in two 90-minute segments (recorded). EMF Balancing Technique® Bridges of Grace Combination Sessions! “Tune up” energetically and “tune in” multidimensionally! Get ready, as the year 2019 begins with the energy frequency of evolutionary opportunities. In these times of The Great Evolution, we have personally and collectively been building our energetic foundations as “bridges of grace”. We are all growing rapidly in our abilities to live life energetically aware. The next steps for those of you who choose to grow in this way are exciting and empowering. From deep in my heart, I know this will be time well spent together. When we each take personal responsibility to do our part, the Universe may then do the Universe's part with even greater resources. Remember, as always there is a time to be still and a time to take action. Knowing when and how to be still and when and how to take action is golden! Let’s choose to do this … simply and gratefully… because we can. 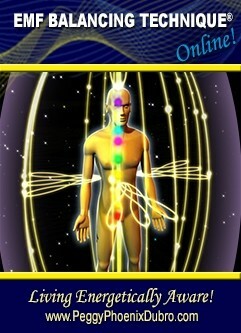 EMF Balancing Technique® Online Energy Sessions … the technique that goes beyond! These group energy sessions are empowered by the human to human connections we make through the Collective Lattice, beyond our time and space coordinates. Peggy initiates a unique resonance for the specific intent of the session, then works with the collective energy patterns generated for the session. Each individual's Universal Calibration Lattice® responds according to their own personal inner wisdom as they say “yes, no, or maybe :-)” to themselves. The coherence generated together during these sessions is filled with the energy of Infinite Love … and in the energy of Infinite Love, you are alive, electrical, and highly transformative! Amazing … because you are … we are … absolutely amazing! The year of innovative action, 2019, is almost here. We are ready for our next adventures of expansion and growth, personally and collectively. We are co-creating new foundations for conscious freedom, and we have an ongoing opportunity as we continue to evolve our abilities to live our lives energetically aware. This combination Phases I & II energy session fine tunes the balance between your intellect and your intuition, greatly strengthening and enhancing your sense of being and expressing. It is a very opportune time to develop your evolutionary “sense abilities” as much as possible now. The energies of Self-direction and Self-support will be energized and elevated to new levels of empowered presence. Why are you here, what do you have to offer, and how can you redefine your life of choice? These are the foundations for 2020 and beyond. This session will also include Phoenix Inspiration and Insights energy patterns co-created by the group and translated by Peggy. Personally and collectively in the last eight years, we have all participated in a sometimes intense universal training period. During this time we have developed new skills as we have learned how to transform challenge into opportunity. We have strengthened our resolve to fulfill our reason for being here, and the Phoenix of our spirit is ready to rise … again! This combination Phases III & IV energy session will open contemporary channels of energetic flow now available to create healthy, wholehearted circulation of your most precious resource: your personal energy. There are so many ways to become more present, and as multidimensional beings we are just beginning to discover how we do this. Remember: the key to freedom is to be as fully present as you can be. In the fullness of your presence, the energy of your life potentials can now be revealed in greater detail. Your most beneficial and benevolent conscious choices for your life of purpose are illuminated by your ability to know and be more of who you are.